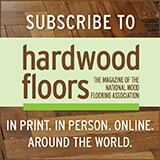 Who Should Determine When a Job Site is Ready for Wood Flooring Installation? A common issue often seen that may result in failure is installing a wood floor before the job site is ready. The building must be completely enclosed. All the windows and doors must be installed, the ground must be properly covered in any crawl space, and the insulation between the floor joists should be installed. Verify that the building receiving new flooring is maintained at the expected in-use (that is, normal living) conditions for temperature and humidity for a minimum of five days preceding installation to promote proper conditioning of the space. Permanent or temporary heating, cooling, humidification or dehumidification systems may be necessary to achieve and maintain these conditions. All the wet trades (concrete, masonry, plaster, drywall, texturing, and painting of the primer coats) should be complete. The subfloor must be tested for moisture content (MC). The subfloor MC must not differ from the wood floor outside the acceptable range of 4 percent for strip (less than 3” wide) or 2 percent for plank (3” or wider). The subfloor is also required to be flat, free of squeaks, and free of protruding fasteners. 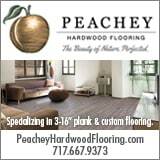 The flatness tolerance for wood flooring is typically 3/16” over 10’ or 1/8” over 6’. These conditions are in place to ensure that if proper installation techniques are used, and proper maintenance procedures are followed, the floor will not fail. None of these conditions are within the capability or the responsibility of the flooring installer. The general contractor (GC) is responsible for having these conditions met before the installer’s arrival. It is the installer’s responsibility to assess the site conditions and report the issues that need to be corrected before delivering and installing the wood. Unfortunately, since the hardwood flooring installer is one of the last tradespeople to arrive at the site, they usually encounter a scenario in which the project is behind schedule and the GC applies pressure to get the floor installed right away. It seems as though some GCs don’t realize that installing a wood floor before the site is ready can lead to a failure. Sometimes the floor fails after the home is occupied. Repairing or replacing the floor after the home is occupied will end up costing significantly more in the long run. In addition to the cost of the floor repair, you also have to consider baseboard/millwork removal and replacement, furniture removal, paint touch-ups, and possibly a hotel stay for the homeowners while the floor is being repaired. It may seem fair that the GC should be the person to pay for this repair since they were the ones putting pressure on the installer to get the job done before it was ready; however, it is the responsibility of the installer to assess the site before installation. Once the installer begins the installation, he/she has deemed that the site is suitable for the flooring product and takes responsibility for the installation. The installer must make the GC aware of the issues that may cause the floor to fail, so the GC has an opportunity to address the issues. If the flooring contractor fails to correctly assess the floor or ignores issues that may cause a failure, the failure will be the responsibility of the installer, and he/she will be left with the cost of repair. 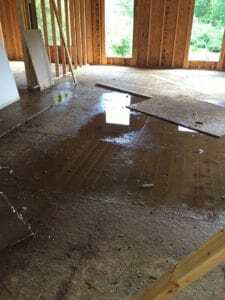 It’s crucial for the flooring contractor to document what the job site conditions are at the time the GC wants the flooring installation to begin. A comprehensive pre-installation checklist is available from the NWFA to make it easy to assess the job site properly. If the installer has determined the job site is ready for installation and he/she has documented proof that the conditions were acceptable, then the flooring contractor will not be held responsible for a failure as he/she cannot be held accountable for the environmental conditions after he/she has left the job site. Flooring contractors succumb to the pressure that GCs put on them for fear of losing the job to another flooring contractor that will either take the risk or doesn’t understand the consequences of starting an installation before the job is ready. Educating the GCs of the site requirements should be done at the time when the bid is submitted, and it should be clearly stated in the contract that these conditions must be met before delivery of the wood flooring. Starting a job where these conditions haven’t been met is risky, and sometimes the job you walk away from can be the most lucrative move you can make. Working for GCs who continually set you up for failure is not worth the risk. Failures damage your reputation, which directly affects the amount of money you’re able to charge. Some flooring contractors believe that having all the conditions listed previously is unrealistic and GCs will never change the way they schedule their jobs; however, it is important to recognize that a flooring failure affects the GCs reputation as well. If the GC continually builds homes with a long punch list after completion, it will limit what he/she can charge as well. We are all in this business to earn money. Doing the job correctly the first time will increase profitability because you don’t have to come back to do repairs or replace the floor. It will also give you a better reputation that will allow you to charge what you’re worth. Prev Tech Talk: What Steps Do You Take When Assessing Potential Moisture Situations at the Job Site? Great article. May I suggest another GC responsibility that is critical? The floor should be clean from the activities of other trades, e.g. sheetrock mud and debris, paint overspray. In my opinion, I would like to see the article take the matter one step further putting the installer in the position of responsibility and making these decisions with the homeowner when there is no GC to control the job site or perhaps flooring is the only trade. Installers that commonly work with a GC who should know what to do must adapt by taking charge and work with the homeowner who does not know and who relies on the expertise of the flooring installer to deliver a great floor.